Here's another gem from him. "Our" people? As a congressman aren't Americans his people? Not only that but his roots are from Puerto Rico. How many Puerto Ricans are here illegally? So who are these people that he calls his own people? I think that Gutierrez is ashamed of his roots and wishes that he was Mexican or Central American. Personally, I wish he would renounce his US citizenship and move to some third world Latin American hole. Jose Angel Gutierrez is just as bad as Luis Gutierrez (Jose Angel is in post #7). I didn't watch the video because Jose Angel makes me just about physically ill. I believe that he is the one who said that we must kill the gringo. Obama wasn't lying to him, was he? They are probably good buddies. I can't help but think Gutierrez will have some ramifications for saying this! I wonder why Illinois isn't housing thousands of Obama's precious kids. I know what you mean. I get uncomfortable seeing some of the videos because they are so angry, and they spew these comments out to the public! No wonder so many of the younger kids are already so angry. They are taking over America. California's largest ethnic population are latinos. So who do you think the lations are going to vote for, the latino running for office. The current latinos elected to office will try to make it easier for illegal latinos to get into the US and get the benefits. This practice is spreading to other states and won't stop. 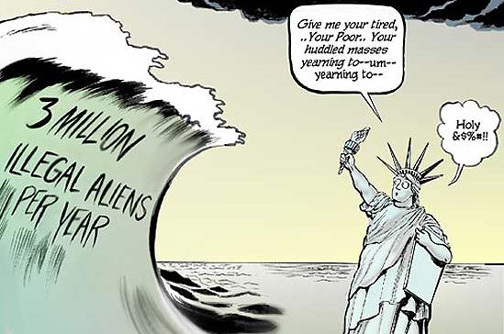 This is a silent invasion of America, and Obama is facilitating it. I knew it would be this moron when I opened this thread. He's a hateful racist jerk who blames everyone else for this. I wish I lived in his district so I could vote against him. Don't worry we probably will. We spend a lot on taxes for illegals and their kids because of incompetent idiots like him. If it was not for lax immigration and low info voters this traitor would never have any power. Hate to tell ya this! but low info naïve ignorant voters are here to stay. Ever hear some of them speak. I did on tv a couple of nights ago. When asked, yes they want everything for nothing, they really do. They see nothing wrong with taking things for free. Infact one guy said a big screen would be nice. One women said that not only a cell phone but also a stereo system would be nice, because she loves music. Can't make this stuff up. There you go, those who believe in taking things they do not earn, are not going to change anytime soon. Make it easy on these lazy bums, and they never will work.